Making the right technical choices when you build your website will affect the extent to which you can easily improve your on-site SEO. At the very least, your CMS should provide you with enough flexibility to build a site that is both usable by you, the site owner, and by your site visitors. Once you have settled on a technical architecture, you will need to decide on a site structure that best exposes your content to site visitors, and to the search engines. - What pages will the homepage link to? - How many, and what are the top level content categories? - How deep will these content categories be? - How will relevant pages link to each other? The answers to these questions will should result in a fairly obvious navigational structure. Be sure to test it with real users too. 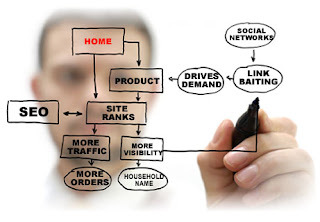 Getting your on-site usability right is just one aspect you should be considering as part of your overall SEO plan. This navigation structure will also help web crawlers to determine what pages are considered the most important on the site. It will also help to establish the relevance of any content you might have to specific topics too. 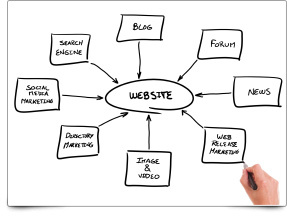 There are a few others factors that you will need to keep in mind as you develop and refine your sitemap though. Some of these are summarized below. One of the cornerstones of effective search engine optimization, is the targeting of appropriate keywords. You will need to know the types of terms and phrases that people use to search for services and products similar to yours. Ideally, your site's navigational structure and page hierarchy will be a reflection of this. One of the most powerful feature of the web, is the ease with which anyone can navigate from one page to the next, by simply clicking a link leading to a relevant piece of content. It is important to ensure that your site is internally complete, and that you make it easy for visitors to find additional relevant content easily. Even on ecommerce sites, linking to related complementary products or indeed alternatives, can be incredibly powerful and profitable. Amazon does this well with the "What Do Customers Ultimately Buy After Viewing This Item?" and "Customers who bought this item also bought..." links. Also important to keep in mind, is linking content that might seem intrinsically different. Your CMS for example, could provide anyone viewing an article on topic X with a link to an image gallery of the same item, or a discussion about it on your site's forums. "Click this link" is not the most informative anchor text. Today, web users are savvy enough to be able to follow links without being explicitly told to "Click Here". Anchor text is also incredibly powerful for indicating to the search engines the subject matter of the target document. Everyone involved in producing and linking content on the site should understand the importance of using descriptive anchor text, particularly when linking to other internal pages and documents on the site. Navigational aids such as breadcrumbs can make a significant difference to the overall usability of your site. This is true for both search engines and human visitors to your site. The breadcrumbs noted above will also help you realize if you are going overboard with your site's hierarchical depth. If you have Home>Category>Sub-category>Sub-sub-category>sub-sub-sub-category>Content, it is probably time to pause and re-evaluate your site's hierarchy. Keeping your site shallow will reduce the number of clicks users have to perform to find your content, and will also do wonders for your SERPs rankings. Generally, the rule when coming up with a structure for your site, is to keep it as simple as possible. Simple for your site's visitors to understand, simple for the search engines to crawl, and simple for your internal content developers to maintain. 0 Response to "Structural Decisions Around Search Engine Optimization (SEO)"